Little annoying problem has arisen since the last blog... a rattle from the exhaust at around 2000 to 3000 rpm. Quick talk to Richard at GBS seems to be a small issue with an internal pipe which slots into the tailpipe section. 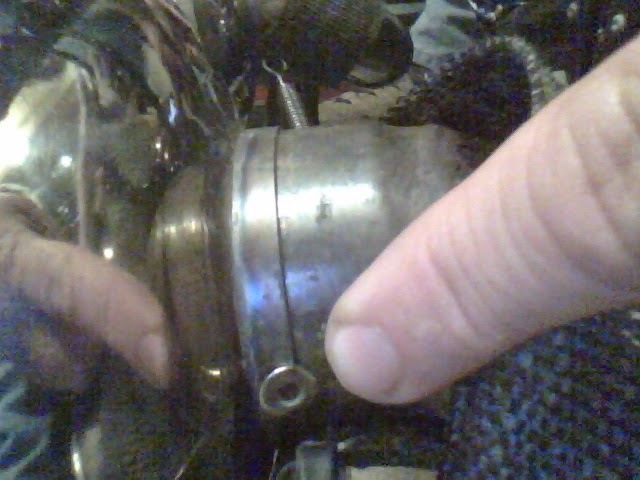 Recommends a rivet through the tailpipe and the internal pipe which should stop the rattle ? Well did this on Saturday, and it worked ! Hi Bill - looks like you installed the rivet on the nearside / 8 or 9 o'clock position looking forward - is it critical where on the tailpipe it goes? Rickard, Sorry I failed to mention... I had slackened off the silencer and rotated it round to place the rivet, and now the rivet is on the underside out of view. Placement on the tailpipe is not critical, but the inner pipe is just a push fit and only goes approx. 1/2 inch into the tailpipe, so as close to the silencer as possible. Hope that makes sense ? I do believe mine has also developed this rattle. Hadn't given it much thought to be honest as the whole thing rattles away and my headphones are usually on full power so drone most of it out. What size rivet did you use? Hi Zach, I used a 5mm blind stainless steel rivet. I have to say that quite a few other builders have reported a similar issue when I was at the GBS open day back in June, and this simple fix seems to have worked. Fantastic, I have just ordered these. Hopefully will make it sound a little bit smoother now :) Ah I see, glad to know its possibly not my engine on the way out haha!